The Great Summer Bake Off? Making bread can be a great activity. You don’t need a lot of expensive ingredients and children of all ages can participate in some way. Get them to help weigh and then combine the ingredients and give it a good stir and once you have your dough they can help with the kneading. The periods of rising mean that they can go off and do other activities in between (so they don’t get too bored) and you could even inject a bit of science by explaining how the yeast helps the bread to rise and what’s happening each time when you ‘knock it back’ (this is a good video to show them). If you have more than one child to entertain why not divide the dough between them for the final rise and allow them to make their own rolls or do something a bit more creative like plaited loaves or other shapes. When you’ve made the bread you can use it for lunch or tea or even go out to the park and have a picnic! Kids love to make cakes, mainly because they get to lick the spoon afterwards! Instead of sticking to the usual sponge cake (as good as that is), why not make something a bit more interesting for them. Cake pops are pretty easy (using a silicon mould which you can but quite cheaply) and fun to decorate plus you don’t need a huge amount of cake batter to make a set of 20 because they’re quite small. You can also make coloured ones and bake them into a cake to achieve a ‘polka dot’ design inside, only revealed when you cut into it. If your baking isn’t quite up to scratch or you just fancy something a bit easier there are lots of things you can make by melting and setting in the fridge. There are some delicious recipes you can make using your child’s favourite chocolate bars such as this Maltesers and Mars Bar slice (very naughty!). Why not kill 2 birds with one stone – keep the kids busy AND make tea for the family. 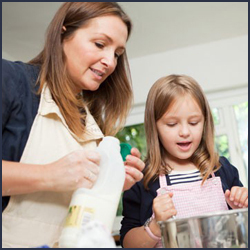 Little ones can help with stirring and measuring out while older children can peel, chop and slice and maybe even some actual cooking. Salads are good because there’s no actual cooking involved and even the smallest child can tear some lettuce up and arrange salad veg on a plate. Get them to make smiley faces or designs with their ingredients (you never know, they might even eat a salad by the time they’ve finished!). If you like the idea of bread making you could make your own pizza and get them to add their own toppings. For older children you could set them the challenge of coming up with their own menu and have them make the family meal (with some assistance of course). They could even get younger siblings to act as their sous chef and help prepare veggies or fetch utensils or ingredients! There are lots of ideas for these and all our other summer activity blogs on our Pinterest board Summer Kitchen Activities for Kids. Next week we’ll be bringing you a bit of science so come back on Monday 28th July! 0 Responses to "The Summer Kitchen Activity Guide Part 1: Cooking and Baking"